Like many people here in the U.S., we grilled yesterday for our Memorial Day enjoyment. We had the usuals, like Barbecued Chicken, hamburgers, potato salad, Cole Slaw and Baked Beans. And we also had these amazing Smoke-Roasted Pears, which were also done on the grill. It all started Saturday as my daughter and I were watching PBS. They had an all day marathon of Steven Raichlen shows, with scenes of glorious barbecue calling to us and making our stomachs rumble. In case you don't know, Steven Raichlen wrote the Barbecue Bible, and How to Grill, and other cookbooks. My daughter really wanted to try his Smoke-Roasted Pears, so that's what she made on Monday. Oh my, They are incredibly delicious! 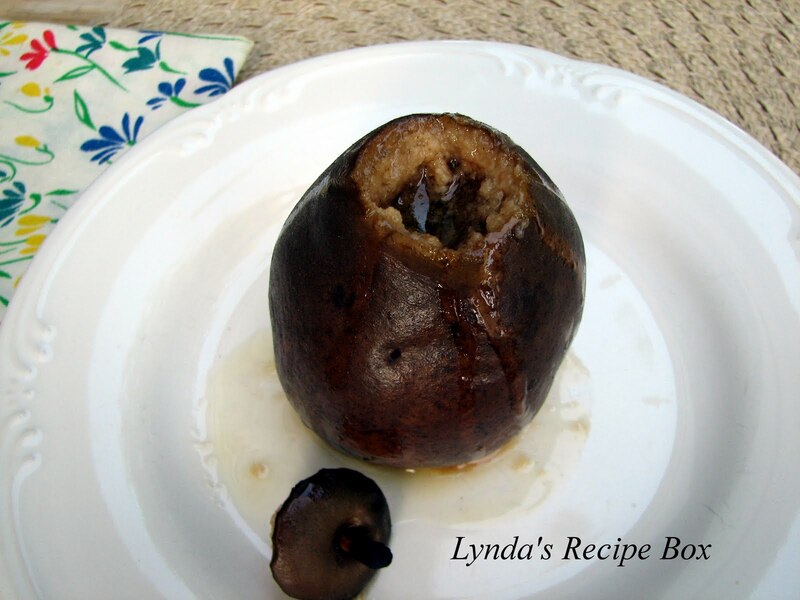 The pears are cored and filled with a struesel like filling which when smoked, gives the flavor of a rich, smokey, caramel filling. Yum! The photos do not do these pears justice, but they are delicious! The cored pears are put in a foil baking pan, filled with the brown sugar mixture and then put on the grill over an indirect fire. In other words, don't put them directly over the coals, or they will burn. I cooked them with the BBQ chicken, setting the pan at the far edge of the grill, opposite the chicken. Doing it this way, I had to rotate the pan a couple of times to ensure even cooking. If you cook the pears only, the coals can be placed on each side of the grill and the pears in the center. The grill is covered, and the pears were done in about 35 minutes. It will depend on the temperature of your grill as to how fast they cook. I put hickory chips on the coals, which gave Hailey's pears the smokey brown appearance. They are done when you squeeze them and they feel soft, but not too soft, and the brown sugar butter mixture is bubbly. It should take 40-6o minutes, according to the book. You've got to try these! Although we ate them alone, they'd be irresistible with vanilla ice cream. Beat the butter and brown sugar in a bowl with a wooden spoon. Stir in the graham crackers, cinnamon and vanilla. 1. Cut a thin slice off the bottom of each pear, so that it will stand upright in the pan without wobbling. 2. With a paring knife, cut out the stem end and remove it. 3. Using a melon baller, scoop out the core and the seeds of the pears. 4. Rub the bottoms and tops of pears with lemon juice. Squeeze a few drops of lemon juice inside each pear to prevent browning. 5. 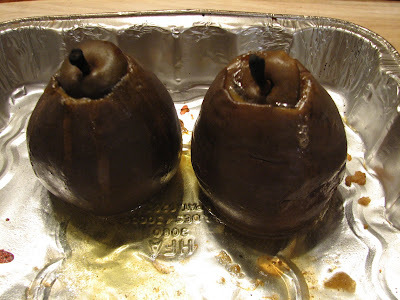 Stuff each pear with the filling and place in an oiled foil pan. Place the stem cap back on top pf the pears. Can be prepared several hours ahead, if desired. 6. Set up your grill for indirect heat. I use a charcoal grill, and I placed a handful of hickory wood chips in the coals after I placed the pears on the grill. 7. Close the grill and smoke roast the pears until browned and soft on the sides, and the stuffing mixture is bubbly. This took 35 minutes for us, but the recipe calls for 40-60 minutes. Serve immediately, if desired. Ours were served about an hour later and they were wonderful! These smoke roasted pears were to die for! 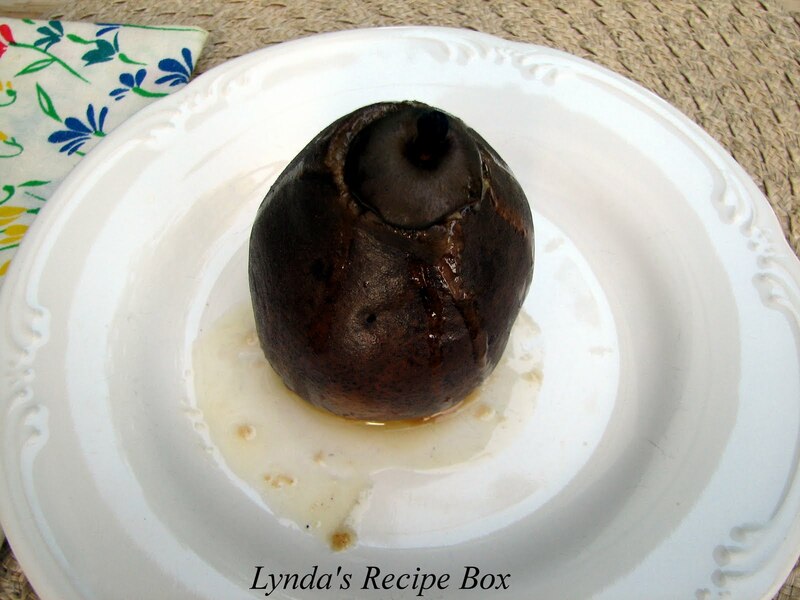 We will be making these smoky, caramel flavored pears often! Note: The recipe also calls for nutmeg, ground cloves, and 1 T. rum, but my daughter didn't want to use them. I wouldn't change a thing in her method. what... leave out the rum???? I do love pear desserts and I love Steven Raichlen's Barbecue Bible. This is a must do - and how gorgeous they turned out! Claudia, they were delicious, but hard to photograph. You had me at caramel filling! They sound divine. See, this is why we need blogging friends. I've never heard of much less see these before today. how interesting and fabulous! i've never considered roasting pears on the grill, much less stuffing them with caramel goodness. this is nothing short of amazing, lynda--thanks! Yum, how delicious and unusual. I've never made one of Steven Raichlen's recipe that I didn't love. This is a must try in my book. Oh, do these every look tasty and beautiful. Such a delicious way to end a nice meal, guest worthy, too. Thanks for this one! 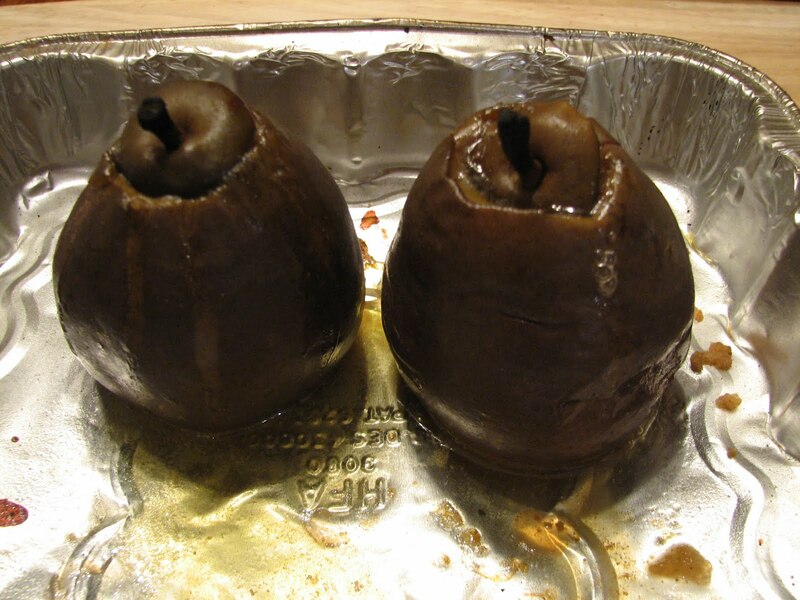 MMMMMMM,...these stuffed pears look delightful: so tasty & appetizing looking! Smoke roasted pears, wow! Definitely a must try! I love, love this idea. Next time we grill it will be on the menu. What a damn good idea, man I wish I had seen this sooner, we actually smoked a pork shoulder on Sunday. I agree. They must be delicious with a dollop of ice cream. Raichlen like Flay doesn't think there is much you can't put on the grill. Well done. While I'm not crazy about warm fruit my kids are....thanks for sharing.